At blue skies in Chattanooga, TN, you will find only the perfect gifts – big and small! We have been working with blue skies for many years, and we’re always thrilled to see Tina show up to see us at Atlanta Market. We’re so happy to call them a partner and we hope you take a minute to explore their store and website at https://shopblueskies.net/! After college, I gained a lot of experience in museum retail at various types of museums: a historic house museum, a natural history museum and the children’s museum here in Chattanooga. These experiences, combined with my personal background in art and my lifelong love of collecting beautiful, handcrafted, funky stuff led me to want to have my own store. After all, you can only fit so much into your own home before the neighbors begin to talk, so opening my own store seemed like the natural thing to do! I opened blue skies in January of 2000 on Chattanooga’s Southside. In 2003, we moved across the Tennessee River to our current home and favorite city neighborhood, the hip and historical NorthShore. From curating the merchandise to brainstorming creative displays, having my own store is like working with an ever-changing canvas. And I don’t work on that canvas alone–it’s been gratifying to see blue skies grow in all ways, including the staffing department. We have a great ‘blue crew’ that includes managers I couldn’t live without: Ginger Carden, Kaitlin Cottle and Denise Shropshire. We attend at least a couple of gift shows every year in search of a varied mix of jewelry, cards and special sundries. We sift through literal buildings of products to find worthy wares. We think about how different lines will complement one another, how they will look in the store and whether our customers will respond to them. Every item we choose has to elicit a reaction – a smile, a laugh, or any high-pitched exclamation are all signs that we’ve found something our customers will love. We say this all the time, because it’s true, blue skies has the best customers! We suspect there’s a connection between all the fun, beautiful and unique objects that fill blue skies, and the people who are attracted to them. While our customers are a diverse demographic mix, we seem to all share the same values. Because Chattanooga is a great vacation destination, we also get our share of out-of-town shoppers but Chattanooga has a strong Shop Local/Support Small Business ethos and we are grateful to have a loyal following of local support. Over the years, many customers have become dear friends and most of our employees started out as customers. We have been carrying Mixture candles for six years and they have become a perennial store favorite! Our first order was on the conservative side but now we make a regular stop at the Mixture Showroom in Building One of the Atlanta Gift Mart – to sample the newest scents and place our next big order. We never allow ourselves to run out. Our customers constantly tell us how much they adore Mixture candles. From the amazing selection of scents to the simple and elegant glass vessels that work with any decor, our customers can’t get enough. People who are new to blue skies generally make it five steps into the store before inquiring about ‘that wonderful smell.” We guide them to our Mixture display – which includes a weathered wooden cabinet that looks like its former home was an apothecary store. Here, they discover the rich variety of Mixture scents. 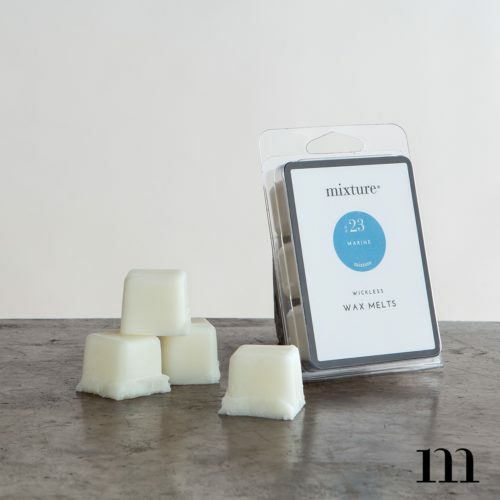 A favorite customer gift is an assorted selection of three Mixture votive candles. People come again and again to purchase this combination, whether for housewarming, birthday, hostess, or holiday. Mixture has become one of our favorite blue skies’ suppliers. 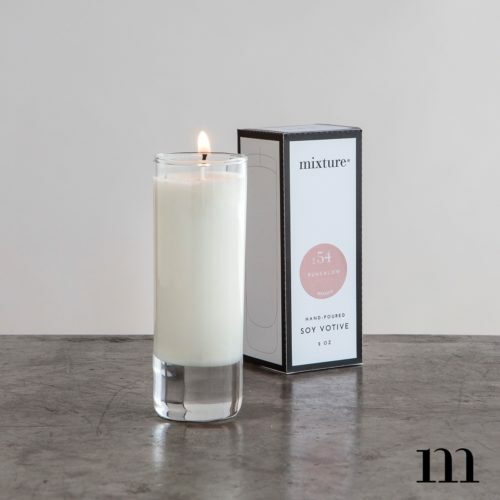 We love that the Mixture staff is so pleasant and helpful, that the candles sell so well, and that the line is constantly growing with the introduction of new scents. Everyone has their favorites and just when you think you’ve found your top scent, a new one comes along to displace it!